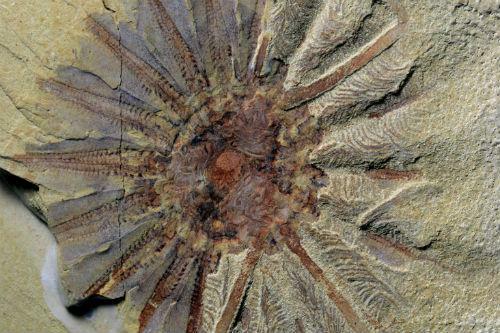 A 520-million-year-old fossil of a sea creature with 18 tentacles around its mouth was found in China. The fossil could help solve a modern-day mystery about the origins of a gelatinous carnivore called a comb jelly, a study published in the scientific journal Current Biology revealed last week. According to the study, the “sea monster,” which scientists dubbed Daihua sanqiong, shares a number of anatomical characteristics with the modern comb jelly. Comb jellies use bands of iridescent, rainbow-colored comb rows along their body to swim. These rows are composed of densely packed cellular protrusions, known as cilia. According to the study, these combs may have evolved from the ancient tentacles seen in the Daihua. “To make a long story short, we were able to reconstruct the whole [early] lineage of comb jellies,” by doing anatomical comparisons, Vinther said, adding that along with the similarities with comb jellies, the discovery of the ancient sea monster was a big deal as it may have been among the first animals to evolve on Earth. The 18 tentacles of the Daihua contained “fine feather-like branches with rows of large ciliary hairs,” which were used to help the creature catch prey, the statement added. However, Daihua isn’t the only ancient creature to have so many arms. Another ancient creature called Xianguangia had 18 tentacles, along with the tulip-like sea creatures Dinomischus — which lived 508 million years ago and had an organic skeleton — and Siphusauctum. “We also realized that a fossil, Xianguangia, that we always thought was a sea anemone is actually part of the comb jelly branch,” co-author Cong Peiyun, said in the statement. In the study, the researchers demonstrate how the comb jellies evolved, describing the organic skeleton it had during the Cambrian period — earliest time division of the Paleozoic Era, extending from 541 million to 485.4 million years ago.